Complete doll shop, vintage to modern dolls, plush toys, antiques and children's vintage accessories. We specialize in fine antiques and collectibles. Antiques, furniture, and collectibles. Something for everyone. An antique center on 3 levels filled with antiques, collectibles and more. Jewelry, glass, railroadiana, coins, and collectibles. If you've ever been to our Westmont (west suburban Chicago) store, you know that we never sit still. There are always new (or rather, old) items coming in from Europe. We're forever decorating, moving, changing. Our visitors are constantly amused by all this activity and amazed at the breadth and depth of our merchandise.Whenever a shopper turns a corner in our 8000 square foot store, he or she discovers another new treasure. And Richard or Robin, the friendly proprietors, are always around to help find that special piece, whether it's buried somewhere in the store or ordered from our world-class suppliers in Europe. As you browse our virtual showroom, you'll note we specialize in anitique or reproduction country pine and hardwood furnishings. You'll also want to view our wide selection of original or reproduction country garden accessories. We wanted to give our web site visitors the same feeling. This site will be constantly changing as we bring you more high quality antique furniture and accessories from our monthly European shipments. Richard and Robin will regale you with stories about how and where they found their latest discovery. You might even hear from Hector, our 16 year-old Macau who likes to make his presence known at the most unexpected moments. So wander around, send us e-mail if you've got a question, and enjoy! And if you're in the neighborhood, drop in and tell us what you think of our web site. Antiques, furniture, jewelry, collectibles, glassware, and pottery. Antiques, collectibles, candles and crafts, porcelains, dolls, jewelry, gently used furniture and accessories. 3 levels ranging from marbles to suites of furniture and everything in between. Specializing in vintage jewelry, sterling, toys, and holiday decorations. Fine Antiques on consignment, certified appraisals and estate sales. Art, Antiques, jewelry, collectibles, pottery, and a little bit of everything old. Antique (and later) jewelry, garden, vintage lamps, clothing, books and more. Furniture, linens, glassware, and many great gift ideas. Design, construction, installation, restoration of residential and church stained glass. Antique furniture, collectibles, and gifts. We search far and wide to bring you the most hard to find Antiques and Collectibles and if we don't have what your looking for we will try to find it for you..... Let us know what your looking for and if we have it we will e-mail a picture if not we will make it our goal to find one for you. Wide range on antiques, book, furniture, vintage clothing, jewelry, fiesta and jade-ite. American primitives, antiques, American folk art and replicas. A consignment shop with fine furniture and decorative accessories. 19th and 20th century antique furniture and period accessories. The 1836 pine board floors and hand-hewed beams are still rendering service. 15 dealers. Gracious historic mansion, 36 rooms including 2 restaurants. All Antiques come from England and France. Specialty gifts, antiques, visitor information center and coffee shop. Two buildings of furniture, glassware, and kitchenware. Large spacious mall that is home to 75 dealers. Outdoor market April through October. Antique jewelry and collectibles, we have been in business since 1930. We specialize in vintage clothing, jewelry, books, glassware, etc. French Antiques and gifts. Unusual and whimsical, a one of a kind find. 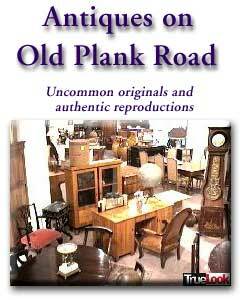 Antique mall with 30 dealers and featuring antique furniture and collectibles. Recollections Antiques, Etc. Estate Sale Treasures, Gifts, Furniture, Collectibles. Jewelry: Deco, nouveau, sterling, Victorian, pocket watches, and new jewelry. We repair and appraise jewelry. Specializing in home accessories, French antiques, vintage glass, silver and service. Look at our warehouse with over 7,000 sq. ft. of antiques. We travel to England, France, and Belgium to find the most beautiful and practical antique furniture for todays living. 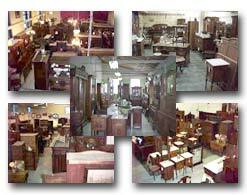 We have hundreds and hundreds of pieces of furniture in our warehouse and showroom. We have dozens of armoires, Bedroom sets, diningroom sets, china cabinets, bookcases, desks and many unusual items such as clocks and victorian music boxes. Chicagoland, please visit our two locations with a combined area of over 11,000 sq. ft. !!! Full of furniture. 19th century American country furniture, quilts, lighting, folk art, textiles and decoys. Over 30 shops, Antiques, Specialty, Gifts and Café. Primitive antiques, folk art, and hand made functional art, we also have a bridal registry. Primitives, bears, gift items and homemade chocolate. Antiques from England, France, and American Antiques. Parlor sets, silver, and pine. Museum quality Antiques, estate jewelry, fine art and antiques.